i have to start off by sharing this quote that i fell absolutely in love with! i think it's just so easy to get lost in our daily routines that we all forget to smile and say hi to all the people walking past us! i know that when the summer comes i will probably be begging for the cold to come back, but as for now i'm as happy as a bee. yess smiling ear to ear! i can't wait for the weekend, my daddy and i are going to a car show and then sunday i'm going to a bat mitzvah for my guys little cousin and lastly my sister is having a 'goodluck/goodbye showcase' for their high school dance team that leaves for florida next week to compete at the UDA Nationals! have a charming rest of the week! This is a great look! Gorgeous colors and this palette brings out the beautiful red in your hair. Vibrant colors look gorgeous on you! Such a cute look! Your red hair is sooo pretty! 1) you have an amazing sense of style, I love it! 2) your hair. it kills me. you look totally amazing! we are so much loving your puprle sweater! and we have to say; you have such wonderful hair! Are you going to the L.A. Auto Show? Sounds like something to look forward to! Love the inspirational quote, and I love to see you smiling in your photos! Positivity is the name of the game! 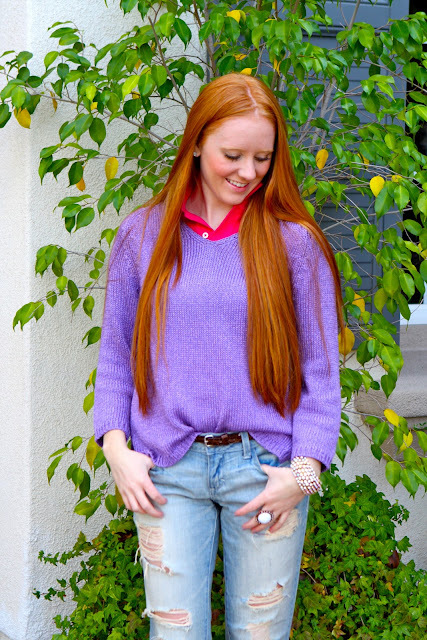 Your purple sweater makes your hair color stand out so beautifully! I wiah we were in the 80's degree because I am tired od this cold. You look so lovely. Love the colors too. a great outfit! 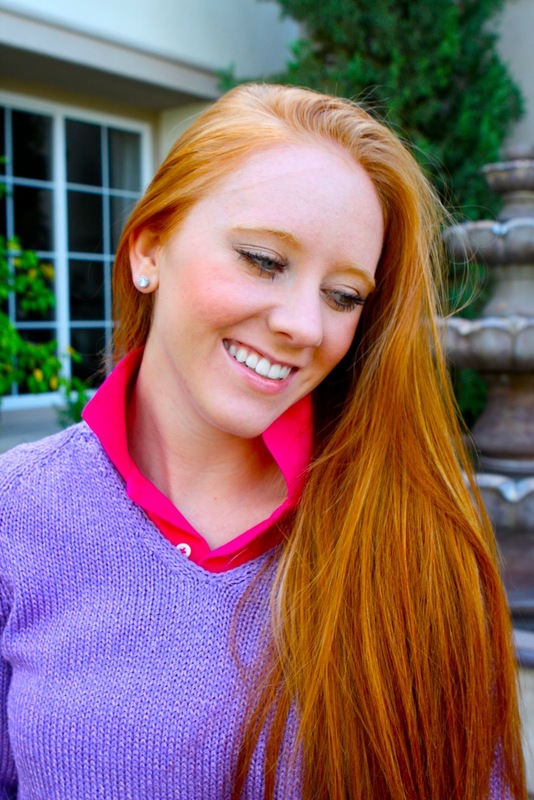 I would never have dared to wear this color combination, but it looks great on you! wonderful! Oh wow, I love your purple sweater! It's beautiful!! You look so radiant in this! I love love your sweater and shoes...also, 80 degree weather? So lucky! awwww what a fresh outfit it is! you're looking sooo amazing with that huge smile! Hello there sweetie! I just found your blog. Congrats, I really like it! Come and visit my cooking blog 2 if you're interested! So many beautiful colours in one outfit! I also love how your hair colour looks! great outfit! i love the pink with the purple. Great color combination !!! Such a nice outfit !! i love that color on you! it looks incredible with your hair! i love that color on you, it looks incredible with your hair! I wanted to invite you to enter a giveaway i'm hosting on my blog, is open worldwide so you don't have any excuse not to participate!! 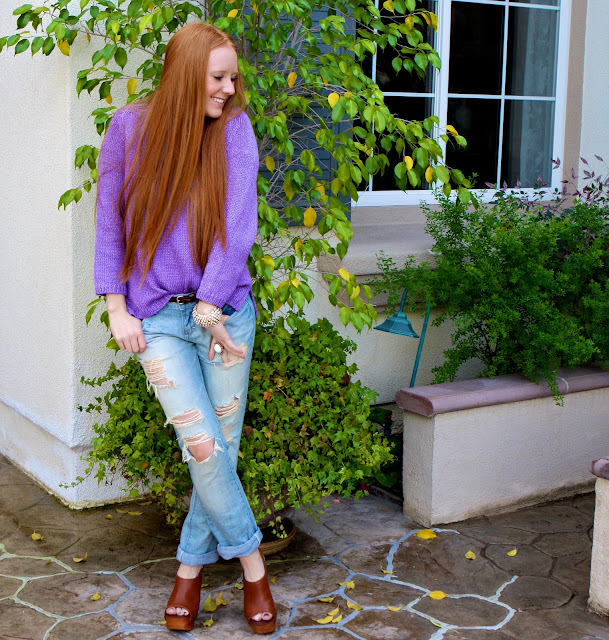 awesome colours, loving your jeans and wedges! ps: aren't you on lookbook?? the purple and pink look absolutely STUNNING on you!! wooow. I'm diggin the rebel prepster look! Love the lavendar sweater...great color!! great colors on you! and your eyes are gorgeous! dear im already following you so plzz if you want follow me back " bloglovin, facebook"
You look lovely as usual!! Color blocked this perfectly!!! We love this! Just came across your blog its really cool & inspiring! I love your outfit you look great & your hair is pretty! Lovely post! Love the images! great outfit like how you used colour! You have AMAZING HAIR!!! great outfit and I LOVE your blog and found it from a comment you left on another blog, it would be cool if we could follow each other! You have such fabulous hair! looking lovely! But you are so beautiful, dearie. As ever, I'm very jealous of your gorgeous red locks. You ahve such a gorgeous hair color!! I love it!!! And i love this colorful outfit!! Come to visit my blog and if you like let's follow each other through Bloglovin and GFC! Great colour combination in this look! Love your blog and now follow you.Check out my blog if you want. These colors are so pretty together! So cheerful & springlike!